Despite not losing wickets too many wickets initially, the Big flourish didn't quite come, but Rajasthan Royals have a competitive score. RR could've looked to accelerate much more in the middle overs, especially when Ajinkya Rahane and Rahul Tripathi were batting. Not all is lost, they've gone bowling heavy today. The Royals will be pretty pleased with the total. The move to send in Jofra Archer at the top backfired but Tripathi's impressive knock of 80*(58) was the highlight of the first innings. 18:32 IST: Good 2 overs for RCB. 19 runs came off them. 18:20 IST: Powerplay is done and RCB look well-set make it an interesting chase. Let's see if they do it inside 15.5 overs or not. 18:14 IST: Parthiv Patel looks in excellent touch and AB de Villiers looks well-set right from the beginning. 18:10 IST: Looks like AB de Villiers has picked up from where he left in his last innings vs SunRisers Hyderabad. 3 Fours off Jofra Archer's over for him. 18:86 IST: Kohli was playing for the 15.5 over requirement. He charged down but was beaten. 18:02 IST: Looks like Parthiv Patel is looking to take RCB home inside 15.5 overs. Gets 2 SIXES in Jofra Archer's over. If RCB can win inside 15.5 overs, their NRR will go above that of MI. 17:41 IST: Rajasthan Royals post 164/5 in 20 overs. Looks like Heinrich Klaasen had taken the responsibility of taking RR to competitive score upon himself. What an unconventional batting! 17:30 IST: Another good over for RCB. Their bowlers have done exceptionally well to restrict RR. 17:28 IST: Just 5 runs off Yuzvendra Chahal's over. When are RR going to accelerate? Are they aiming to go past 150 only? 17:21 IST: Heinrich Klaasen gets two FOURs in the over as RR are inching towards the score of 150. Will that b e enough? 17:15 IST: Rahul Tripathi came down the wicket and sent the ball right over the bowler's head and over the ropes. 17:11 IST: What an eventful 14th over from Umesh Yadav. Two wickets from it. He almost got the 3rd one too. 17:06 IST: 100 up for RR in the 13th over. 16:55 IST: Rahul Tripathi brought up his 3rd IPL fifty and tried to shift gears. Walked down the track and sent the ball into the sightscreen for a SIX! 16:52 IST: Another over goes by, just 6 runs off it. When are Rahane and Tripathi going to go after the bowlers? 16:48 IST: 10 overs gone and 10 to go. First time Rahul Tripathi has reached 30 in 16 innings. The last time he did was when he scored 93 at the Eden last year. 40 runs have come in last 5 overs. 16:42 IST: Tripathi and Rahane are now well-set. They need to accelerate the scoring rate. RR still have 9 wickets in hand. 16:36 IST: Mohammed Siraj bowls an excellent over. Just 4 runs off it. 16:26 IST: Rahul Tripathi began Yuzvendra Chahal's over with FOURs over the mid-wicket and extra cover. Good over for RR. 16:15 IST: One thing is for sure that Rajasthan Royals are missing Jos Buttler. Although Ajinkya Rahane and Rahul Tripathi have got three boundaries in the over, RR don't look too confident as a batting unit. 16:10 IST: Some confidence for Tripathi as he played a sweep shot over the deep backward square leg for a SIX! 16:07 IST: Turns out to be a failed experiment for Rajasthan Royals. Archer has struggled with the bat and opening the innings did not change his fortune. 16:03 IST: Excellent first over from Yuzvendra Chahal. Just 2 runs off it. 16:00 IST: Jofra Archer to open Rajasthan Royals innings with Rahul Tripathi. 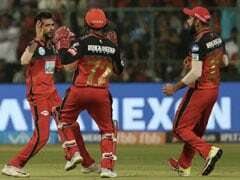 Yuzvendra Chahal opens the attack for Royal Challengers Bangalore. Buttler has been the key for Rajasthan's batting after smashing five consecutive fifties in his last six games and his absence will surely hurt the Ajinkya Rahane-led side. In their absence, Rahane will have to step up and score runs for his team as he has only managed to accumulate just 291 runs from 12 innings. Sanju Samson looks good with 391 runs from 13 games but has not fired in the last few games. The bowling unit lacks depth as only Jofra Archer has been impressive in the last few games but an absence of support from the others is a cause of concern for Rajasthan. Jaydev Unadkat, Dhawal Kulkarni and Krishnappa Gowt ham have been below par and need to come out with their best to stop a star-studded RCB batting line up. 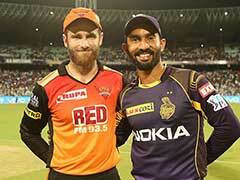 Bangalore, however, will be the favourites in Saturday's crucial clash, which could be seen as a virtual semi-final. 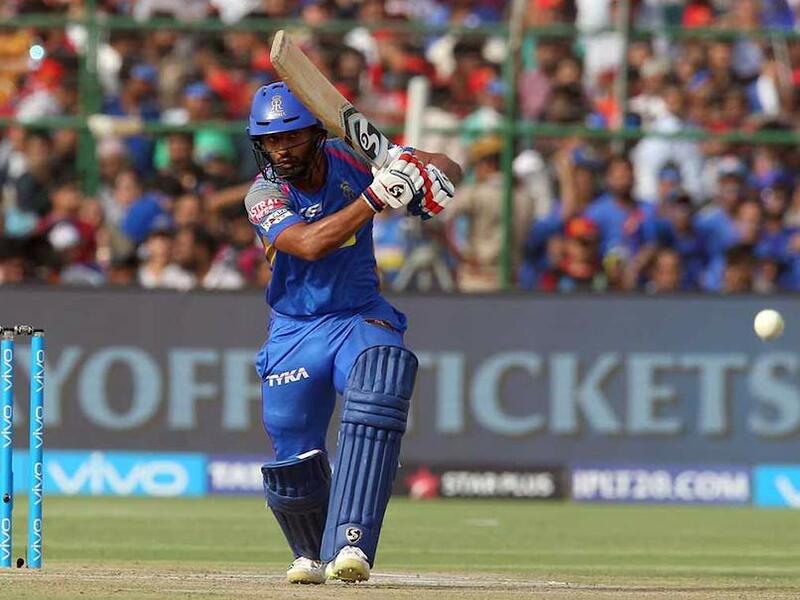 Rajasthan Royals - Ajinkya Rahane(capt), Stuart Binny, Sanju Samson (wk), Rahul Tripathi, D'Arcy Short, Krishnappa Gowtham, Jofra Archer, Dhawal Kulkarni, Jaydev Unadkat, Ankit Sharma, Anureet Singh, Shreyas Gopal, Prashant Chopra, Sudhesan Midhun, Ben Laughlin, Mahipa l Lomror, Aryaman Birla, Jatin Saxena, Dushmantha Chameera, , Heinrich Klaasen, Ish Sodhi.